A precious Birthday outfit headband for your special little one. 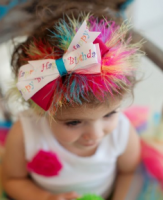 This "Hailey" Birthday headband is adorable with it's gorgeous feathery boa-inspired head piece. 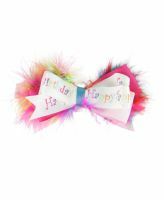 it will make your little one feel ultra special and will last for years becoming a birthday tradition. From the first birthday outfit to the tenth birthday outfit and beyond.